The US and China will extend into the weekend the current round of trade talks as negotiations in Washington yielded progress on currency policy but stopped short of a breakthrough that would prevent higher American tariffs from kicking in next week. The latest series of meetings was supposed to end Friday, but China’s Vice Premier Liu He will stay in the American capital for two extra days. Trump, speaking at the White House alongside Liu and members of his own Cabinet, said he could envision extending the March 1 deadline for higher tariffs by a month or so if there’s more progress. A final deal would be signed at a summit with Xi Jinping, the Chinese leader who Trump said he hoped to meet with in the “not-too-distant future”. Trump said a deal with China is more likely to happen than not, while Liu said that a pact with the US is very likely. Treasury Secretary Steven Mnuchin said a leaders’ meeting for late March at Trump’s Mar-a-Lago resort in Florida is being tentatively planned. The two sides will “speed up negotiations,” Liu said in a statement released by the Xinhua news agency early Saturday in Beijing. “The two countries have conducted fruitful negotiations and made positive progress in areas including the trade balance, agriculture, technology transfer, intellectual property protection, and financial services,” he said. Trade Representative Robert Lighthizer, who is leading talks for the White House, tempered the enthusiasm. He said the two sides have made progress on structural issues related to the Chinese economy but still face obstacles. “We have major hurdles,” he added. Stocks pared gains as the talks yielded mixed results before rebounding at the close of trading. 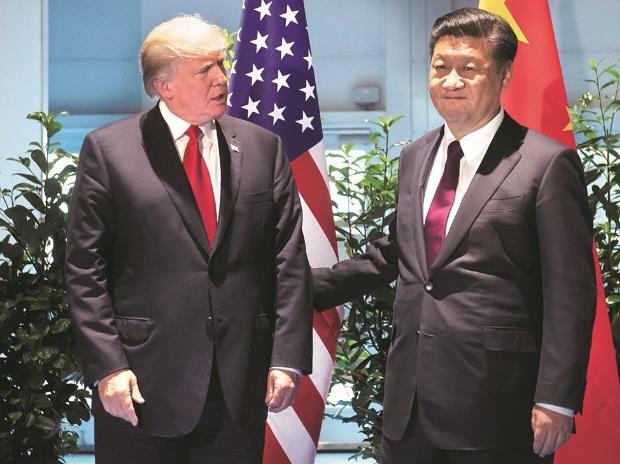 Without an extension of the trade truce past March 1, it remains uncertain whether the US will go ahead with plans to raise tariffs on $200 billion in Chinese imports to 25 per cent from 10 per cent. The nations did agree on a currency provision, Mnuchin said at the meeting. Bloomberg News reported this week that the US was asking China to keep the value of the yuan stable to neutralise any effort to soften the blow of US tariffs. Mnuchin’s announcement of one of the “strongest” currency deals came with no details, such as whether it’s a binding commitment with repercussions if China doesn’t fully comply, or what the enforcement mechanisms would be to ensure Beijing lives up to its pledge. A US request for China to keep the yuan stable against the dollar “is likely feasible in the period ahead and not a big give for China, especially as China wants a trade deal,” said Mark Sobel, a former US Treasury Department official who focused on international affairs. The two sides have been holding rounds of talks in Washington and Beijing in recent weeks to forge a deal envisioned by Trump and Xi during a December 1 dinner in Buenos Aires. The leaders agreed at the time to hold off on escalating the trade war through March 1 while their administrations sought common ground on issues ranging from intellectual-property theft to soybean purchases. Trump had signaled in recent weeks he could agree to an extension on that deadline so long as the two sides made progress toward shrinking America’s trade deficit with China and protecting US firms that operate there. Meanwhile, uncertainty posed by the trade war has taken a toll on both economies and caused some turmoil in financial markets.